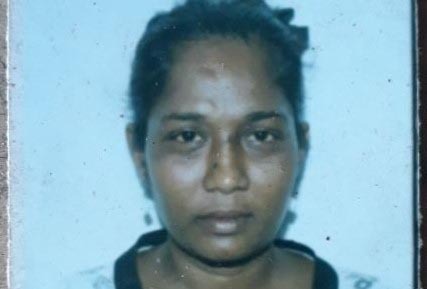 The partially decomposed body of the woman who was found at the Foulis Seawall Access road, East Coast Demerara (ECD) more than a week ago has been positively identified as domestic worker, Indroutie Dass. Stabroek News understands that a cousin of Dass positively identified her body on Tuesday at the Lyken Funeral Parlour. The woman related to the police that she last saw Dass, 44, a resident of Logwood Squatting area Enmore, ECD on September 24. The body was found on September 26. It is suspected that Dass was murdered. However, the police are awaiting the results of an autopsy which is scheduled to be performed today. This newspaper had previously reported that the discovery was made around 9.30 pm on September 26 by a resident who was heading to the foreshore. The police had said that a yellow metal chain was found around Dass’ neck and a pair of multi-coloured slippers and a burgundy cloth hammock were found nearby.